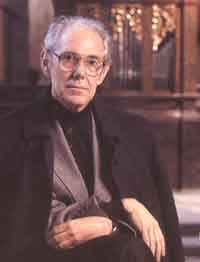 Czech composer, organist and pianist (January 22, 1929, Žamberk, former Czechoslovakia - October 24, 2007, Prague, Czechia). Very important part of his opuses represent compositions of sacred music. He was awarded many prizes for his works: 1990 - by the Czech Government for his organ cycle “Job”, 1991 - he received the Order Chevalier des Arts et des Lettres from French Minister of Culture, in 1993 - he received the Stamitz Prize of the German Künstlergilde, and 1994 - the doctor’s degree h.c. of Prague Charles University. Father of David Eben, Marek Eben, Kryštof Eben. Brother-in-law of Ilja Hurník.